fresh herbs of your choice (I used celery leaves). We wanted to find out how you cook your trout so we sent some sample trout hampers to Irish food bloggers and asked them to come up with a recipe. We think this quick and healthy dish from Katia Valadeau of www.recessionbites.ie looks and sounds delicious. We hope you think so too. Grate the courgettes into a bowl then slice or chop the pepper very finely and add to it. Add the finely chopped shallot and garlic, the shredded herbs and cubed feta cheese to the courgettes and pepper and mix everything gently together. 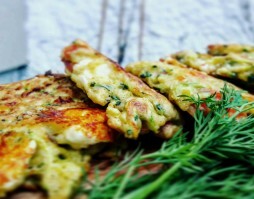 Cut the BBQ trout slices into small bits and mix them with the vegetables, cheese and herbs. In a separate bowl beat the eggs and pour over the mix. Add the flour one tablespoon at a time. You want the consistency to be nice and sticky. Pour a large spoonful of the mixture into a non-stick frying pan to create a ‘pattie’ and gently fry on a low heat for 5 minutes on each side, or until they are golden on the outside and lovely and soft on the inside. If you liked this easy to follow recipe you can buy our BBQ trout in catering packs from our online shop or enquire in our office for smaller quantities. Goatsbridge trout is also available in all good Irish supermarkets, including Supervalu and Dunnes Stores as well as specialist shops around the country. For more Goatsbridge trout recipes, news or competitions sign up for our newsletter.